Check out this cottage on Secord Lake! 98' of sandy swimming, sandy beach, level to the water all sport Secord Lake water frontage!! The water is clear, shallow & sandy & the view is spectacular! 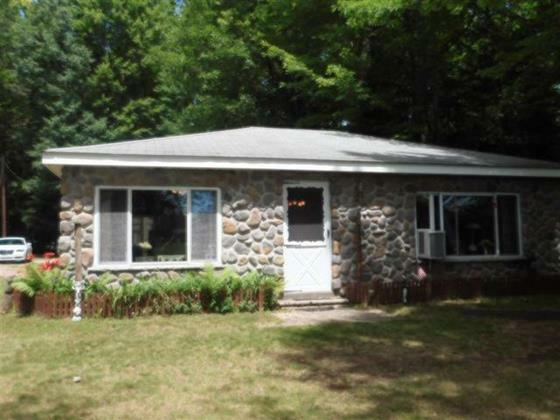 Secluded from the road this 2 bedroom, 1 bath cottage sits on a .62 acre lot w/ a section of woods for privacy & a nicely treed/shaded lot in the front. Beautiful perennial plantings, a patio with a included screen gazebo, camper trailer used as a guest house, storage shed & huge 28x28 pole barn w/ 10' sidewalls complete the exterior. Inside the vinyl sided with stone front cottage you will find an open kitchen, dining & living room where the family can gather. Snack bar for additional seating. Lots of newer wallside windows allow the lake view in. 2 bedrooms & a full bath. Cottage can be turn-key meaning furnishings, pots, pans & dishes, & the '98 Crest Pontoon with an '02 90 hp Johnson. Been in the same family since the 60's - time for a new family to make memories! Hi Sonya, This is a fantastic cottage in a beautiful, peaceful location. The stone front, covered patio, and great backyard are a few of the features that will attract prospective buyers.